If you want to learn how to shoot a basketball, you begin by carefully observing someone who knows how to shoot a basketball. If you want to be a writer, you begin by carefully observing the work of accomplished writers. Recognizing the importance that modeling plays in the learning process, high school English teacher Kelly Gallagher shares how he gets his students to stand next to and pay close attention to model writers, and how doing so elevates his students' writing abilities. If you want to learn how to shoot a basketball, you begin by carefully observing someone who knows how to shoot a basketball. If you want to be a writer, you begin by carefully observing the work of accomplished writers. 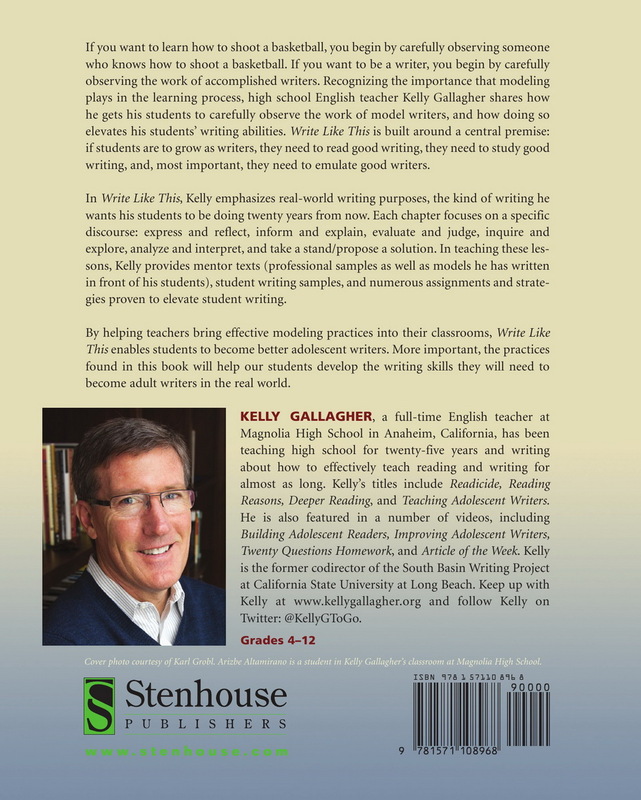 Recognizing the importance that modeling plays in the learning process, high school English teacher Kelly Gallagher shares how he gets his students to stand next to and pay close attention to model writers, and how doing so elevates his students' writing abilities. Write Like This is built around a central premise: if students are to grow as writers, they need to read good writing, they need to study good writing, and, most important, they need to emulate good writers. By helping teachers bring effective modeling practices into their classrooms, Write Like This enables students to become better adolescent writers. 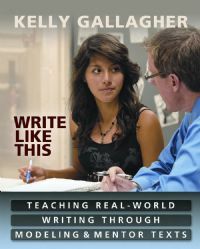 More important, the practices found in this book will help our students develop the writing skills they will need to become adult writers in the real world. Kelly, a "baseballoholic" and a self-described expert at negotiating airports, is in his thirty-third year of teaching at the high school level. He currently teaches at Magnolia High School in Anaheim, California. So What Do They Really Know?